On Sunday, March 20 from 12 p.m. to 2 p.m., all Pottery Barn Kids stores will be hosting The Very Hungry Caterpillar storytime in celebration of the 3rd Annual Very Hungry Caterpillar Day. The event includes free activities for families as well as a reading of The Very Hungry Caterpillar and his adventures into becoming a butterfly. If you are looking for a fun, free, family-orientated activity on Sunday, make sure to stop by your nearest Pottery Barn Kids store. Did you know that the Pottery Barn Kids catalogs use actual children's books as props in many of their product photos? I recently sat down with the late spring 2011 catalog and played my own version of I-Spy children's books. I started listing the titles on a piece of paper and ran out of room! Here are just a few of the titles I noticed displayed in the pages of their catalog: The Carrot Seed, Big Red Barn, Little House on the Prairie, Eric Carle's Animals Animals, and The Tale of Peter Rabbit. The actual list is much longer. I even saw some titles that I've never heard of, but plan to look for next time I'm at the library: Tools by Taro Miura, Stanley Goes for a Drive, D'Aulaires' Book of Animals, and A Girl and Her Gator. I'm always on the look-out for new children's book suggestions, even among the pages of a catalog! As far as book related products, Pottery Barn Kids offers Curious George bedding and an adorable Peter Rabbit Nursery set as well as Peter Rabbit Easter items. I think it is great that Pottery Barn Kids recognizes the importance of reading with children and helps promote children's books in their catalogs and during their store storytimes. 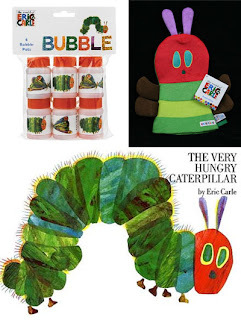 Celebrate the Very Hungry Caterpillar Day with a giveaway! 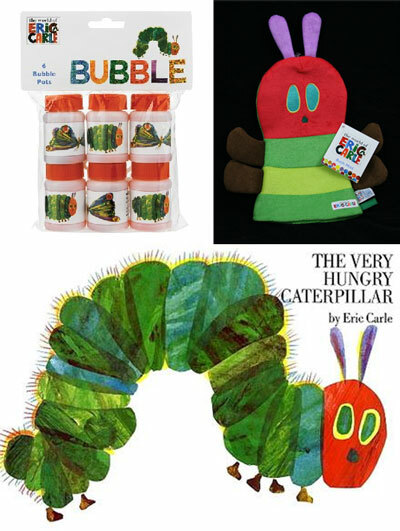 One Brimful Curiosities reader will receive a special prize pack containing a copy of The Very Hungry Caterpillar by Eric Carle, a Very Hungry Caterpillar bath mitt and the Very Hungry Caterpillar bubble set. To enter this contest, leave a comment relevant to this post. Do you have a favorite Eric Carle book? • Contest ends on Monday, March 21st, 2011 at 11:59 PM CST. How funny we are having a VHC themed birthday party on Saturday. It's my son's favorite book! I follow you Google Reader! The Very Hungary Caterpillar is my favorite book, but all of his books have that wonderful bold look. I'm an e-mail subscriber. Thank you. My favorite Eric Carle is 1, 2, 3 to the Zoo. Ahh--we love Slowly, Slowly, Slowly Said the Sloth at my house! My son's like: Have You Seen My Cat. It's repeats a lot, but they think it's funny. I love this book. It is my favorite Eric Carle book. We're looking forward to our Pottery Barn Kids trip on Sunday! My favorite is The Very Quiet Cricket. Thanks. At our house we like The Grouchy Ladybug! Thanks for the chance to win! My grandson likes The Lamb and the Butterfly. Our favorite is The Mixed-Up Chameleon. My favorite Eric Carle book is The Very Hungry Caterpillar. I am going to call my daughter and tell her about the celebration of Very Hungry Caterpillar Day at Pottery Barn Kids stores. My grandson will just love it. I am a subscriber via email and RSS reader. The Tiny Seed is another good one. I loved the Mixed up Cameleon. We like The Rabbit and the Turtle. MY favorite would be the Very Hungry Caterpillar, but my Bebe Boy's favorite is Where Are You Going? To See My Friend! Thanks for the chance to win! Brown Bear, Brown Bear is read quite frequently at my house! 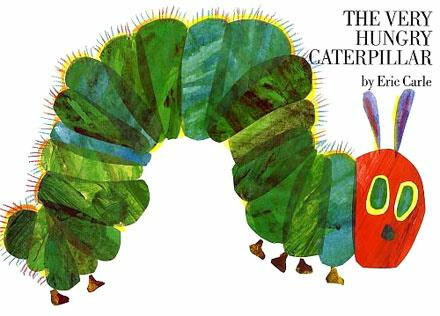 I enjoy all of his books especially the Very Hungry Caterpillar. I think The Very Hungary Caterpillar is my favorite! I always loved "Polar Bear, Polar Bear..."
My favorite is the Very Hungry Caterpillar. I read it to my preschool class when we're on the letter C. We also sort fruit and do color sheets. My granddaughter is all about the ladybug - so The Grouchy Ladybug was the 1st book I added to her book collection. I'm a huge fan of pandas, so my favorite is Panda Bear, Panda Bear, What Do You See? We always read Brown Bear Brown Bear ... I should go grab Hungry Caterpillar though. I think my son would love it. No, I haven't read any Eric Carle books. My favorite book by him is Brown Bear, Brown Bear. My favorite would be the very hungry catepillar! Thanks for hosting! I like polar bear, polar bear, what do you hear. The Very Hungry Caterpillar is our favorite. If we could win it, we wouldn't have to check it out at the library! I follow via google. My kids love this book and have it memorized. We go crazy over all of Eric Carle's books. my 4 year old nephews love The Hungry Caterpillar. My daughter liked the Very Hungry Caterpillar and now I would like to give my granddaughter the book. my daughter would love to celebrate! It is the Very Hungry Caterpillar that we love. It's been a tradition in our family for years to read it to the little ones, and now we have a new little guy in the family (3) who would love it, I'm sure! We haven't read of any of his books yet, but we'll look for them at the library! Not as of yet, i've never read any.